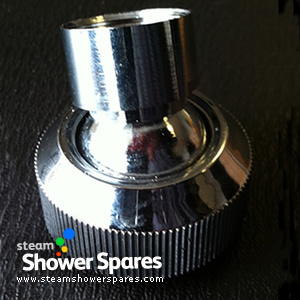 Chrome finished ball socket / swivel joint for use with Chrome finished overhead rainfall monsoon shower. Fits to the threaded end of the back of the shower head and to the chrome water supply tube to enable the overhead shower to be adjusted in angle. This item is for fitting to Chrome Overhead showers fitted to H88 series shower cabins, AquaLusso Crystal Range.